Home #Flaunt that Nailfie Contest nails Winners Nailfie Contest Winners Announced! Firstly, we would like to thank all of them who participated in our Flaunt your Nailfies contest. We had a tough time choosing the winners from the handful of entries received as all of them, excluding some which were plagiarized, were creative, pretty and lovely! 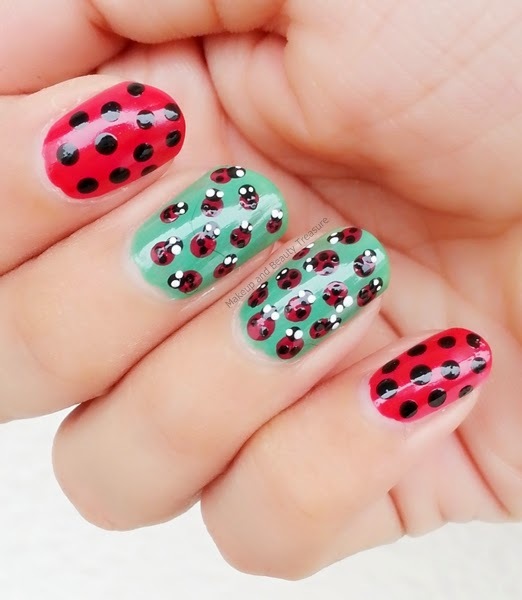 1)The first prize(Goodies) goes to Megha Saraf for her amazing Lady Bug Nail art entry. 2)The second prize(Book My Show GV) goes to Judy for her shares and lovely floral nail art. The Bling Sparkle Trio wishes you hearty congratulations girls! :) Please mail us your valid E-mail IDs to Blingsparkleblog@gmail.com so that we can get in touch with you regarding your prizes and your exclusive interviews. You can check out the other amazing entries for this contest in the comments section of this post. Stay connected on Twitter|Facebook|Instagram|Google Plus for more giveaways and other interesting stuff.